Hi guys. Just a quick and simple recipe while the sun is still shining and the farmer’s markets are still bursting with all of these ingredients. It’s been a busy week over here, prepping for an even busier weekend ahead and attempting to soak in some of this indian summer weather in all it’s glory. September for most means back to school and back to routine, but for us it’s usually when we start feeling like it’s about time to get away. We’ve got a few short trips planned in the upcoming weeks, and then we’re hoping to escape to the coast come October for a week or two. I sometimes forget how lucky we are to call this place home, so I’m feeling grateful that we still have so much to discover in our own back yard. I met a young couple on a cross country bike trip the other day, and it made me so nostalgic. Not for the biking (let’s be honest), but just for those simple days spent outside with Matt. It’s crazy to think that we just finishing up only a year ago, but it’s even crazier to think that we were just starting up already six years ago. September will forever be a good time in our story. Memories and these ‘indian summer nachos’, all too good not to share. Local eggplant season is somewhat short lived here but man is it ever good. Eggplants, tomatoes and a smoky red sauce – like indian summer nachos if you will. How close these come to tasting ‘deep fried’ is almost scary, but good. They are incredibly soft on the inside with little salty crunches of cornmeal on the outside. The flavors of this harissa tomato sauce are no strangers to the blog (evidence here and here) but it’s a combination that works and I do love it. It comes together in 20 minutes and would be great some grilled veg or simply stirred into a grain bowl. Holding on to summer a little longer, it’s been a good one. Eggplant technique barely adapted from Green Kitchen Travels. Turn the broiler onto to medium-high and position your oven rack in the middle of the oven. Roughly quarter the tomatoes and shallots, and peel the garlic. Place everything on a rimmed baking sheet and add smoked paprika, a good pinch of sea salt and drizzle with olive oil, about a tablespoon. Place under broiler until slightly charred and bubbly, about 15 minutes. If your broiler gets too hot, turn it off and finish the tomatoes at 425 F / 220 C. Remove from oven and let cool. Take the pieces of the roasted shallot, garlic and about 1/3 of the charred tomatoes and place in a small blender. Add the roasted red pepper and harissa and blend until smooth. Roughly chopped the remaining tomatoes and place in a bowl. Add the blender ingredients to the chopped tomatoes and stir. Taste and adjust for seasoning/spice. Heat the oven to 425 F / 220 C for the eggplant. Mix the cornmeal with the sea salt in a shallow bowl. 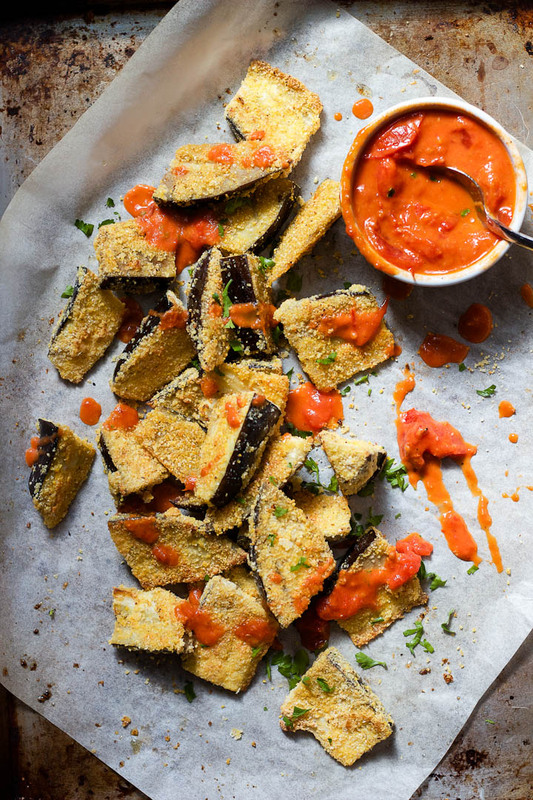 Remove a wedge of eggplant from the milk and coat in polenta mixture. Turn a couple of times to make sure they are well coated, then place on a baking sheet line with parchment. Repeat for all eggplant wedges. Brush the top side of the eggplant with olive oil and bake for about 12 minutes or until crispy, then flip, brush the now top side with olive oil and return to bake for another 8-10 minutes or until golden brown. Serve with harissa sauce and fresh flat leaf parsley. Although best out of the oven, eggplant will heat up nicely the following day. Bake at 400 F / 200 C for about 7 minutes. I love using cornmeal as a breading! It gives everything an amazing texture and bonus points for being gluten free! 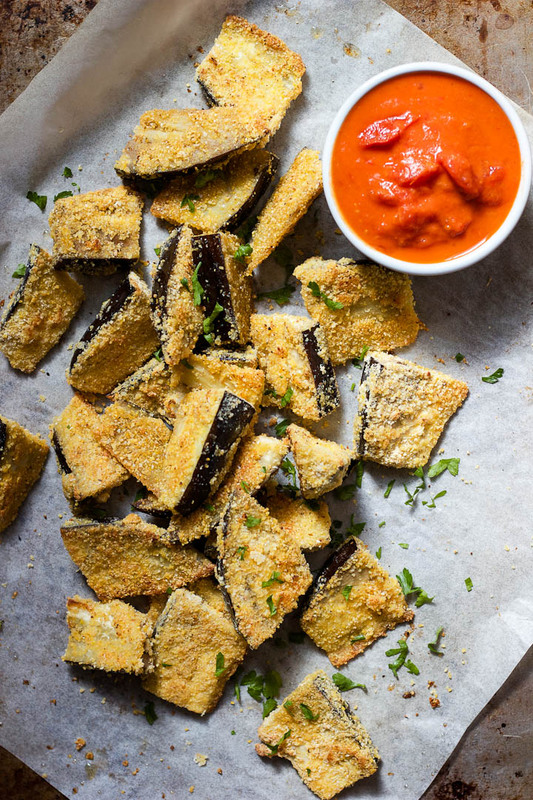 I love crispy eggplant fries so Im positive I would adore this dish!